The flying of the Royal Standard or The Personal Flag of The Queen, in the absence of the Sovereign is a rare event. Tradition and protocol has long prescribed that the Royal Standard, like other distinguishing flags, can only be flown in the presence of the principal. 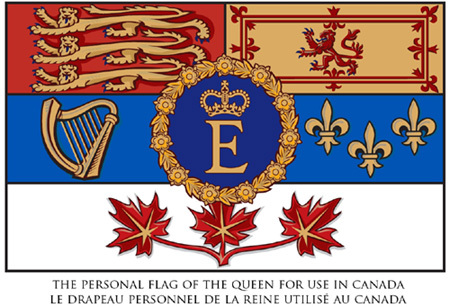 The Royal Standard was flown throughout Nova Scotia, New Brunswick and the Province of Canada during King Edward VII famous Royal Tour of 1860, when he was Prince of Wales. On the day of King Edward VII's Coronation, 9 August 1902 celebrations where held around the world. In Halifax at His Majesty's Dockyard, the officers and men of the Royal Navy, Royal Marines, Canadian Militia and various local dignitaries gathered to mark The King's coronation with a flag raising. The Royal Standard was raised on a temporary flagpole located near the periphery of the dockyard. Hours following The Queen's Coronation on 2 June 1953 a ceremony and parade were held on Parliament Hill in Ottawa where Governor General, the Right Honourable Vincent Massey, PC, CH, CC, CD, presided over the nation-wide celebrations. As part of these celebrations The Queen's coronation speech was broadcast and Her Royal Standard was flown from the Peace Tower to mark her Coronation. During the 2010 Royal Tour of Her Majesty The Queen and His Royal Highness the Duke of Edinburgh, The Personal Flag of The Queen was flown from the pole in front of Government House during the three days that the Royal Couple was in residence. The Flag was also flown on HMCS ST. JOHN'S during the International Fleet Review on 29 June 2010 as part of the celebrations surrounding the centenary of the founding of the Royal Canadian Navy.